TUESDAY: Donut, mandarin oranges, choice of milk or juice. TUESDAY: Dunkin stick, pineapple tidbits, choice of milk or juice. FRIDAY: French toast sticks, banana, choice of milk or juice. TUESDAY: Funnel cake, assorted cereal, fruit, juice, milk. Susan Yearsley, teacher at Harrison County High School, has been elected to the board of directors of the Kentucky Association of School Councils (KASC). Susan has worked in education for over 20 years, the past eight serving as the secretary and teacher member of the Harrison County High School Site Based Decision Making (SBDM) Council. She is a dedicated council member and takes seriously the role and importance of school councils in reaching the state’s proficiency goals. In beautiful autumn weather, the Harrison County Marching Thorobreds performed at the Morehead State University Blue & Gold Band Competition on Saturday, Sept. 29. The band continued its winning streak by placing first in Class AAA while taking home class awards for Best Percussion and Best Color Guard. At the end of the preliminaries, the band was situated in first place overall, by the nearest of margins. MONDAY: Chicken nuggets with roll or hot ham and cheese, emoji fries, baked beans, pineapple tidbits, fresh fruit, milk. TUESDAY: Mandarin chicken or beef teriyaki dippers, steamed broccoli, carrots with dip, steamed rice, diced peaches, fresh fruit, milk. MONDAY: Breakfast pizza, or cereal or Pop-tart, fruit, choice of milk or juice. THURSDAY: Sausage, egg and cheese slider or cereal or Pop-tart, fruit, choice of milk or juice. Below is a listing of all salaries paid by the Harrison County Board of Education for the 2017-18 fiscal year. Salaries are provided to the Cynthiana Democrat by the Harrison County School District, in compliance with state law. The highest paid employee in the district is Superintendent of Schools, Andy Dotson, who earned $136,027.92 during 2017-18. The Harrison County High School Marching Thorobreds are on a fast track to regain its honor as the band to beat in Kentucky. On Saturday, Sept. 15, the HCHS Marching Thorobreds marched into Danville to participate in the Boyle County Marching Invitational. 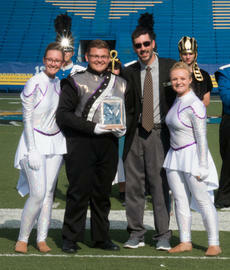 Once again, the band swept all awards in Class AAA, including best guard, percussion and earned first place. 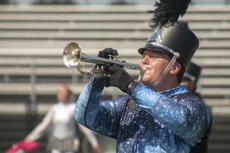 The band was also in the lead position at the end of the preliminary competition.